Slash is confirmed for the Quart Festival 2009 in Kristiansand, Norway. including Ronnie Wood from the Rolling Stones. Other guests are Jason Bonham and Ozzy Osbourne. Slash and Friends will be performing at the Quart Festival on Tuesday June 30. This is said to be the only performance by Ozzy Osbourne in 2009. July 1: Marilyn Manson, Placebo, Volbeat, Dillinger Escape Plan. July 2: Black Eyed Peas, Paperboys, Cyndi Lauper. July 3: Korn, Chris Cornell. 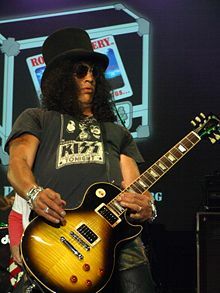 Saul Hudson, better known by the stage name Slash, is a guitarist best known as the former lead guitarist of Guns N' Roses and as the current lead guitarist of Velvet Revolver. As busy as ever, his current schedule is filled with numerous projects, including an animation series, several internet projects, a clothing and jewelry line, a scripted tv series based on his life�being developed by his wife and her company, Honey Pot Entertainment�and a solo project with the working title, Slash & Friends, an album of special guest collaborations. In April of �08, Gibson Guitar commissioned a Slash-inspired Les Paul. Billed as the �ultimate rock guitar from the ultimate rock guitarist,� the guitar has quickly become an in demand model. In the fall of �07, Slash released his long-awaited self-titled biography. He promoted the book by signing copies for fans in bookstores worldwide as well as making numerous guest appearances on the American talk show circuit with visits to David Letterman, Howard Stern, and Jimmy Kimmel. Critically well-received, the book climbed the bestseller list in both the US and UK on its way to selling more than 200,000 copies. For further reading see Slash by Wikipedia and Slash Online. Ronnie Wood is first of all known as guitar player in The Rolling Stones, where he took over the position occupied by Mick Taylor. 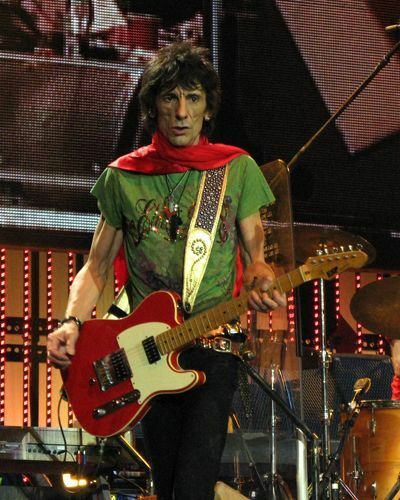 Ronnie Wood first toured with The Rolling Stones in 1975, and is still "the new kid", even if he has been with the Stones for soon 34 years now. Ronnie Wood began his career as a professional musician in 1964 as a guitarist with The Birds By 1967 the Birds had disbanded and Wood had joined the Jeff Beck Group as a bassist. Along with vocalist Rod Stewart, Ronnie Wood did several tours with Beck, and recorded two albums: Truth in 1968 and Beck-Ola in 1969. In between Jeff Beck Group projects Ronnie Wood also worked with The Creation. In 1969, after Steve Marriott left the Small Faces, Ronnie Wood began working with the remaining members of that group, returning to his instrument of choice: the guitar. This line-up, plus Rod Stewart and ex-Bird Kim Gardner, teamed up with his brother Art Wood in a formation called Quiet Melon, making a handful of recordings in May 1969. After the Jeff Beck Group's fifth US tour in July, Wood and Stewart joined the former Small Faces full-time, and the band's name was changed to Faces. In 1972, Ronnie Wood and Faces bassist Ronnie Lane composed the soundtrack to the film Mahoney's Last Stand; the soundtrack, which was released as an LP in 1976, also features Faces bandmates Ian McLagan and Kenney Jones, along with contributions from Pete Townshend and Ric Grech. Wood also performed with Townshend, Grech, Steve Winwood, Jim Capaldi and Eric Clapton at Clapton's Rainbow Concert in 1973. In December 1973, Ronnie Wood collaborated with Mick Jagger on the song "It's Only Rock'n Roll (But I Like It)". Both Jagger and Keith Richards contributed to Wood's first solo album, I've Got My Own Album to Do, released in 1974. Ronnie Wood has been with the Rolling Stones since 1975, and you may read about him on the IORR web site, as well as numerous other sources for the Rolling Stones. 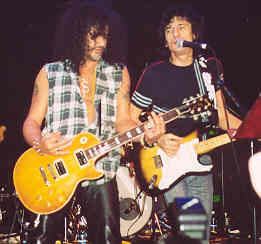 Slash was guest during the Ronnie Wood solo shows in Dublin and London December 2001. For further reading see RonnieWood.com, Ronnie Wood by Wikipedia and IORR.org. 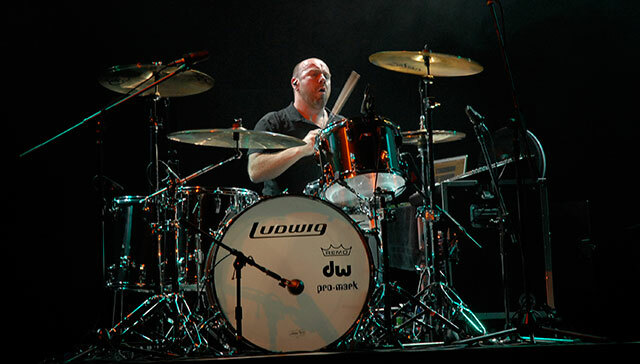 Jason Bonham is very proud of the legacy that his father left behind, and so he should be! The world's all-time greatest drummer, John Bonham, receives a humble tribute from his son in the CD aptly titled "In the Name Of My Father - The Zepset". A newly-formed Jason Bonham Band began performing Zep songs just for kicks and since they all knew the material it was a good way to "test the water" as a new group. A handful of small charity shows were planned but it quickly grew to a full tribute tour as audience reaction was overwhelming. While on tour, Jason would occasionally tape a show, to get an idea of what it sounded like. I'd sometimes listen with the band right after a show - We were all amazed at how great it was on tape, and it was different every night. The idea of recording the set at New York's famed Electric Ladyland studio was initially done only for "posterity", recorded June 17th, 1996. "In The Name of My Father - The Zepset" captures this historic performance for the world to enjoy, in a raw, powerful and emotional set of some of Led Zeppelin's classics including: Communication Breakdown", "The Song Remains the Same", "Ten Years Gone", and "Since I've Been Loving You". Cleverly arranged medleys, segues and jams add a spice of new life into the songs. Superb drumming throughout emphasizes Jason's hard work and dedication, playing the Zeppelin songs like no-one else can. Guitarist Tony Catania is hauntingly similar to Jimmy Page while still showcasing his own unique style. John Smithson provides solid bass and keyboards as his years of experience playing with Jason pay off. Strong, belting vocals from Charles West round up this new line-up. All proceeds are being donated to the John Bonham Memorial Motorcycle Camp and the Big Sisters of Los Angeles. "My father was a very charitable man", says Jason. "I'm following his example. It's a joy for me to be able to play these wonderful songs and give a little something back to help a few young people find their way." Jason Bonham was the Drummer for the Led Zeppelin Reunion. Other bands he has been working with includes UFO, Foreigner, Steel Dragon, Damnocracy. Ozzy Osbourne, born in Birmingham England, started his musical career in a band with Geezer Butler. This group then split leading Ozzy and Geezer to join Tony Iommi and Bill Ward in a new band that went under several names (including Earth) that ended up being called Black Sabbath after a song of the same name that appeared on their first album (released 1969/70). Ozzy Osbourne recorded several more albums with Sabbath despite the decline of his relationship with Tony Iommi, which after several break ups led to him leaving/being fired from the band in 1979. After a short time he launched a solo career with a line up behind him that varied immensely from album to album and tour to tour. Reunited with Black Sabbath in 1985 for the Live Aid (1985) (TV) festival, and again in November of 1992 for the last night of Ozzy's so-called "final" tour. After the success of this show, the idea of a new Black Sabbath record and full tour was proposed, and the contracts were written up. However, Ozzy decided at the last minute not to sign them. It wasn't until December of 1997 that all four original members reunited again, to perform and record what would become the live album "Reunion". 2002: Starring in the MTV reality show "The Osbournes" along with his wife and two kids. On December 8th, 2003 he was seriously injured while riding his ATV quad bike on the grounds of his Buckinghamshire estate in England. The accident occurred while he was taking a day off from his hectic promotional schedule surrounding the UK release of "Changes" - a duet with his daughter Kelly. A tour scheduled turing that time was cancelled, including a show at Oslo Spektrum in Norway. The Ozzy Osbourne remake with daughter Kelly Osbourne of the Black Sabbath song "Changes" went straight to #1 in the UK when it was released a week after his quad-bike accident. 2004: Touring the U.S. with Black Sabbath for the annual summer concert series, "Ozzfest". For further reading see Ozzy Osbourne by IMDB.